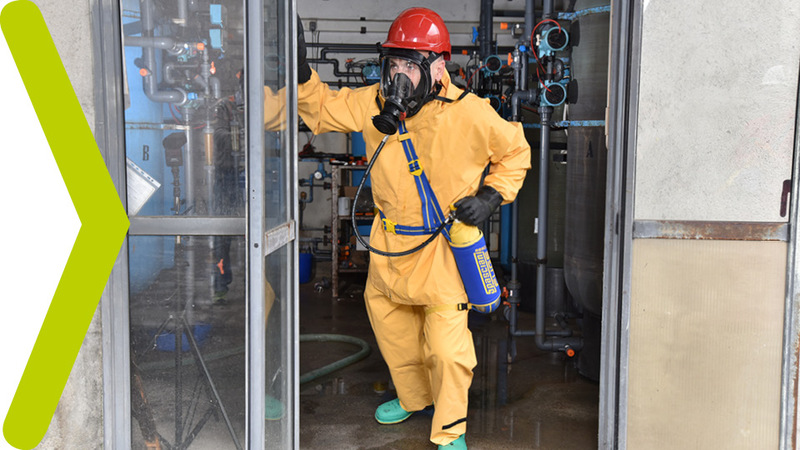 SK1203 is a compressed air open circuit breathing apparatus with hood for escape, from all environments potentially dangerous because of the presence of fumes or lack of oxygen. It is designed to create a constant air flow of 15 minutes thanks to a 2 l300 bar cylinder which is directly connected to the valve/reducer that is provided with a gauge which continuously indicates the pressure inside the cylinder. FUGE is a Self Contained Breathing Apparatus designed for escape that in case of emergency supplies, on demand, an air flow for a minimum guaranteed time of 15 minutes with a 2 l/300 bar cylinder. It has great wearability and it’s totally hermetic. 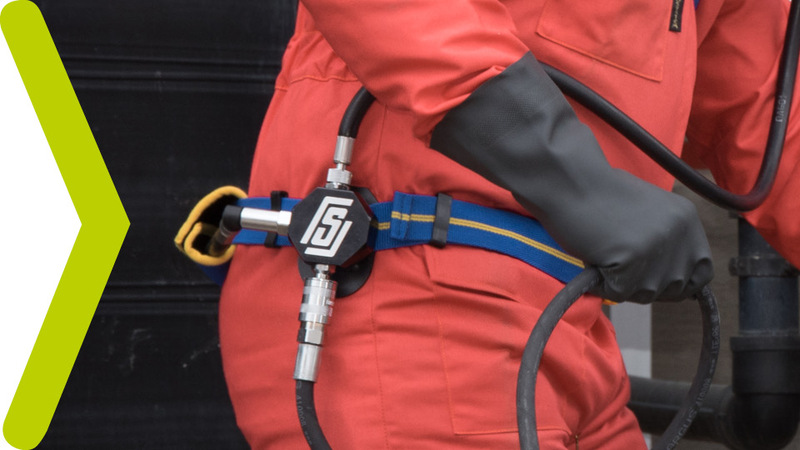 It is meant to be used by specialized operators in all environments where dangerous situations may occur due to fire fumes or lack of oxygen. 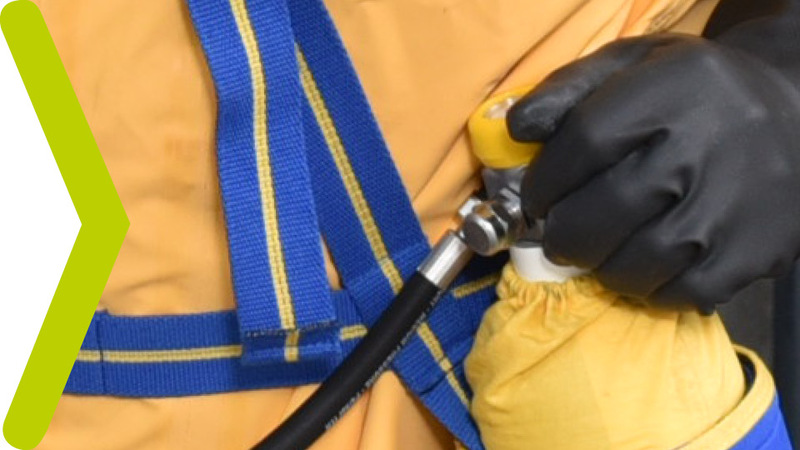 Fuge Rescue and Fuge Tail are provided with a supporting harnesses to keep the cylinder in position on the thigh. This allow the a comfortable wear while enabling the wearer to adjust it according to his needs. This solution allows free movement even in ackward spaces. FUGE RESCUE complete with fully charged steel cylinder weighs 6.7 Kg approx.., with fully charged composite cylinder 4.4 Kg. the line, thus granting, in case of blackout or disconnection from the line, a constant feeding of breathable air. The 3 way valve is placed between the reducer, the demand valve and the feeding line. In case the air supply is cut off accidentally or intentionally, the 3 way valve switches automatically to the cylinder. In such a condition the warning, which is built into the demand valve, is activated. The signal originates from a sounding vibration caused by every inhalation. In this way the full capacity of cylinder is made available to the user for breathing. The acoustic warning is related to the respiratory frequency of the user and allows the user to distinguish his own signal from that emitted by nearby fellows or noise (Self Test Function). The location of the warning device protects it from frost or dirt. The pressure reducer and the cylinder valve are integrated and provided with gauge indicating the pressure inside the cylinder. The pressure reducer keeps the outlet pressure steady throughout the emptying of the cylinder. The opening/closing knob is anti-slip and easily allows to open/close the air supply.